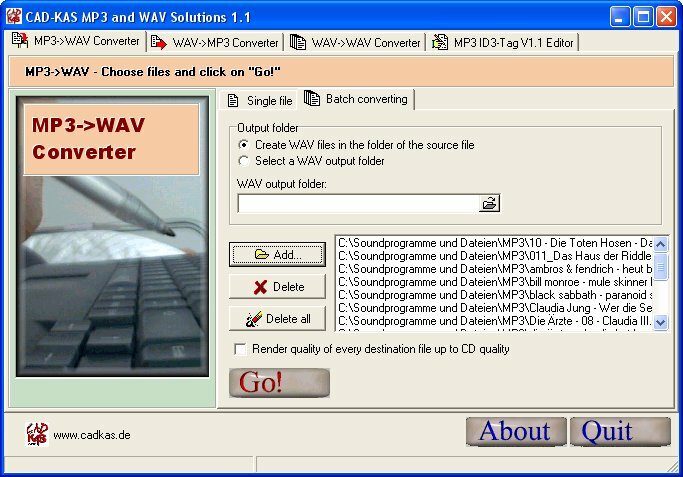 Converts MP3 files easily and quickly into WAV files and back. Convert many files with one click. You can change the sample rate of WAV files and the MP3 tag information of MP3 files. This program offers solutions for daily practice. If you want to burn a music CD you have to convert your MP3 files into WAV files. And if you want to create your own MP3 files you have to record the music as WAV file first. Than you have to save the information about title etc. in the MP3 file. The program offers solutions for all these steps. To edit and cut mp3 files you can use our Ringtone Editor. To ripp music from an audio CD you can use our CD to MP3 Ripper. If you want to fix a scratched audio CD you can use PlayAnyCD. This program you can every ripp defect CDs and burn them on a new audio CD. MP3 and WAV Solutions got the "Softempire Prince" title by the SoftEmpire.com team.